Aaron and I chatted in my kitchen about the album, his book and the documentary (plus a bonus podcast of a few of his favorite gospel songs). 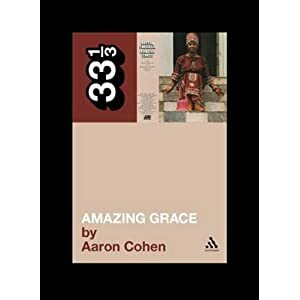 Don’t forget to check out Aaron’s book! This is my favorite gospel album of all time. I always say that if I was in that audience there would have been so many disruptions, because I woulda been throwing my shoes at Aretha (especially during Precious Memories, my fave), snatching people’s wigs off while I “caught the Holy Ghost and just plain falling out in the middle of the aisles. It would NOT be pretty. Needless to say, I cannot WAIT for this documentary to come out! Lawd, Imma be a damn mess up in that theater! REALLY enjoyed this, thanks! and keep up the good work. Strong work. Love to see the gospel posts. yeah, Oliver, really, really strong interview and podcast; a lot of “new” info and good balance of the broadly interesting w/the more arcane, such as gospel types, the Gay sisters, etc. I did know her father was known as somewhat of a ladies man, but had no idea of the Clara Ward connection. Let’s see, Aretha grew up hanging out w/Smokey, she was close w/Clara Ward and Sam Cooke came by when in town . . . all her sisters sang and wrote; safe to say her fate was sealed from a very early age.